A new option for displaying your lists is now available, plus a number of smaller improvements to your account. 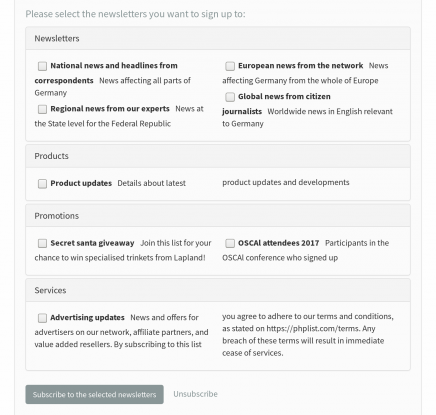 Subscribe pages and embedded forms are shop windows, encouraging visitors to sign up to receive your newsletter content — how they are displayed matters! Now you can categorise the lists which you offer for your susbscribers, making them easier to organise and navigate. Categorisation of lists via the admin interface is a longstanding phpList feature; now however the same categories can be shown to your subscribers on public pages. Categories will only be displayed if public lists exist within them. This feature can be enabled for all subscribe pages, or for specific pages of your choosing. A responsive multi-column layout is used to display the available categories, lists, and descriptions.